The world of art is fantastice and beautiful, but you may feel that it is just out of your reach. 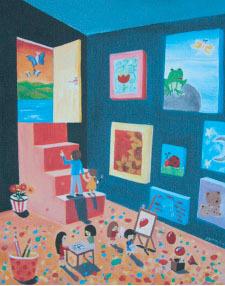 Before entering into the world of art, you will face many obstacles that you must climb over. Sometimes the step will be too difficult and high for you to reach. You will struggle as you try to step on without any help. Some of you may only feel disappointment and despair. Hold our hand, follow us, join our Comprehensive Art Course, let us guide you! All you need to do is learn patiently, have faith, try your best, and never give up. Don’t scribble to your heart’s content – follow our way to learn and you will reach the stars and beyond. Trust in your experienced teachers to guide you as you climb those steps, so that you can conquer the challenge. You will find happiness in facing the challenges because with each success you will love art more and more. When you finally enter into the world of art, you will realise that it is far greater and boundless than you ever imagined. Your eyes will be open wide in wonder at the beauty of this world.